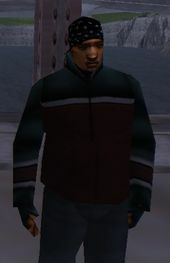 Chico is a character in the 3D Universe who appears as a minor character in Grand Theft Auto III. He is a drug dealer based in Portland, Liberty City. He is voiced by Hunter Platin. Chico, at an unknown time, began to sell drugs to various residents of Portland and became the drug dealer of Maria Latore, wife of Leone Family Don Salvatore Leone, some time after 1998 and the death of her previous dealer, Cedric "Wayne" Fotheringay. In October 2001 Maria meets Chico at the waterfront in Chinatown and asks for her usual after being offered SPANK. Chico then tells Maria of an illegal party occurring in a warehouse in Atlantic Quays and Maria has Claude drive her there. The police later break up the party and Maria escapes with the help of Claude to her husband's home. Chico can be killed by Claude after his cutscene appearance in Chaperone, although it is not mandatory. Chico talking to Maria Latore during the mission Chaperone. This page was last modified on 8 December 2014, at 01:39.